The compressor has a regulator but you may add an end-of-line bleed valve. The Smart Jet Plus Handle Tank compressor, as its name suggests, has a 450cc air tank inside the handle. This feature increases moisture separation which makes the airflow smoother. 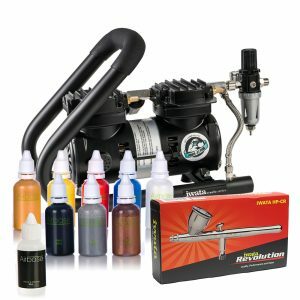 It is also powerful to run two airbrushes simultaneously. It has an automatic switch that turns the compressor on when you press the trigger, giving you instant air at the pressure you have set. And it also automatically turns off when you stop using the airbrush. 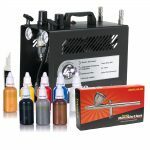 Additionally, it has a pressure adjuster which is useful when applying make-up or body paint as it allows you to reduce the pressure when working on the skin. 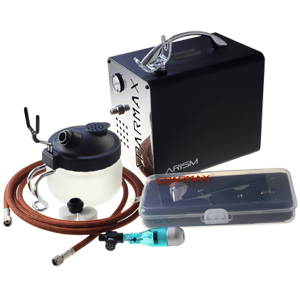 However, for further convenience and control you can add an end-of-line Sparmax bleed valve, an end-of-line moisture filter with bleed valve, or a quick release body with air valve with a quick-release plug. 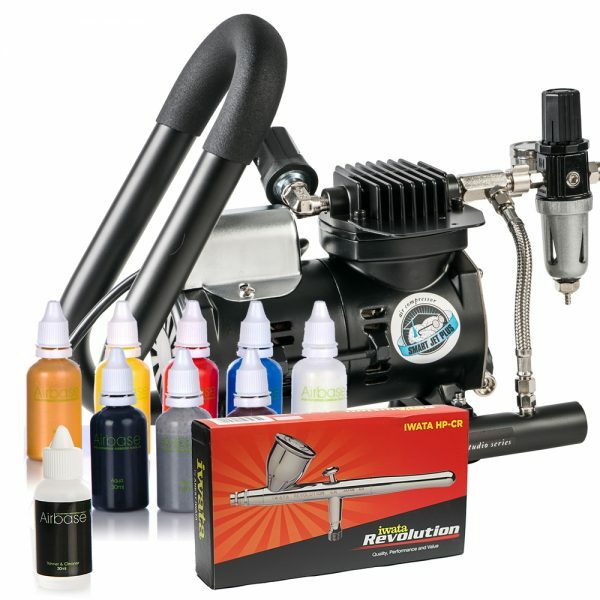 The Iwata Revolution CR is one of Iwata’s entry level airbrush, but it does offer similar quality as some of the more expensive airbrushes. 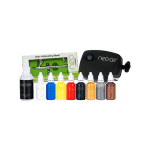 It has a 0.5mm nozzle which is ideal for using thicker medium such as body paint and cosmetic paints. 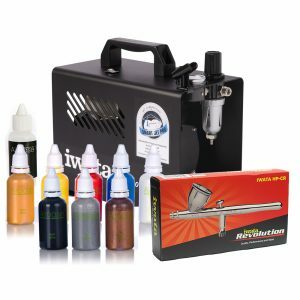 If you want a different airbrush, you can upgrade to any of the other Iwata range. Just simply choose from the options provided on this page. £43.50 x 9 months Delivery: TBA – for an alternative, we suggest the Iwata Power Jet Lite Kit Choose your airbrush before adding to cart. 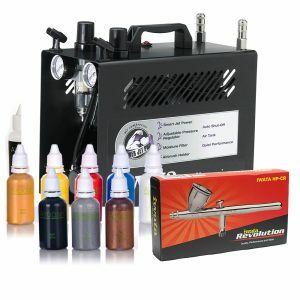 Or pay £45.90 x 9 months Delivery: 3 - 5 working days Please choose your airbrush before adding to cart.